Two separate studies have shown that consuming nuts on a daily basis may provide benefits to controlling weight gain, achieving overall metabolic health, and other cardiovascular benefits. 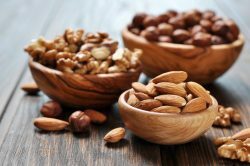 Both studies delved into the influence eating nuts has on feeling full and improving insulin and glucose responses. These are things that can influence body weight. The first study was conducted at the Nutrition Department at the Harvard T. H. Chan School of Public Health in Boston and involved 3 different groups of adults: 25,394 healthy men through Healthy Professionals Follow-up Study, 53,541 women through Nurses’ Health Study and another 47,255 women in Nurses Health Study II. Each of the participants in each group filled out food frequency questionnaires each year for 4 years. The study team discovered that by replacing foods with less nutritional value with a one once serving of nuts on a daily basis resulted in a lower risk of obesity and weight gain over the 4 year length of the studies. They also found that substituting just one serving a day of nuts instead of one serving of a red meat, processed meat, desserts, potato chips or french fries, resulted in less weight gain. One serving of nuts is one ounce of whole nuts or two tablespoons of a nut butter. The study team believes their findings can be applied to the general population even though most of the participants were part of a health profession and mostly white. Many people look at nuts as foods that are high in calories and fat and so do not consider them as a healthy snack item. However, the study shows that they actually are associated with less weight gain issues. When people reach adulthood they will begin gaining weight about one pound per year. Over 20 years that is quite a bit of weight gain. Substituting nuts for less nutritionally healthy foods can help prevent this gradual weight gain and also reduce risks of cardiovascular diseases related to weight gain and obesity. The second study involved Brazil Nuts and was conducted at San Diego State University in 2017 with a grant provided by the American Heart Association. This study involved 22 healthy adults with two men and 20 women all age 20 or older and with a mean body mass index of 22.3. The participants ate either 20 grains of Brazil nuts which is about five nuts or 36 grams of pretzels in addition to their normal diet. The pretzels and Brazil nuts both had about the same number of calories and sodium content. They did this in two trials with 48 hours between each trial. The team found that both the pretzels and Brazil nuts created reduced hunger feelings and a sense of fullness, however the Brazil nuts created a much fuller feeling of satiety. At forty minutes after the snacks were consumed, the team found the pretzels created a significant increase in insulin and blood glucose levels while the Brazil nuts did not. Brazil nuts actually stabilized both the insulin and blood glucose levels after they were consumed which could be beneficial for preventing weight gain. Brazil Nuts are very rich in Selenium which is a mineral that might be associated with the insulin and blood glucose improvements noted in the study. Nuts are packed with fiber, protein, unsaturated fatty acids and a variety of beneficial chemicals. Consuming nuts can help reduce appetite and promote fullness which means people tend to eat less throughout the day. In addition to Brazil nuts, almonds, walnuts, pecans, macadamias and pistachios are other good choices! Next articleHow Important is Genetics for Longevity?